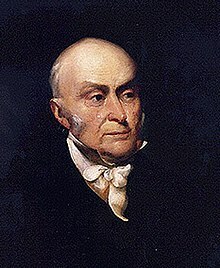 John Quincy Adams (July 11, 1767 – February 23, 1848) was the sixth President of the United States. He was the first President who was the son of a President. Several cities are named after Adams, such as Quincy, Illinois. He was born in Braintree, Massachusetts, in 1767. He watched the Battle of Bunker Hill, a fight of the American Revolutionary War, from his family's farm. When his father, John Adams, traveled to Europe, John Quincy went with him as his secretary. He became good at speaking other languages. He went to Harvard College and became a lawyer. At age 26 he was appointed Minister to the Netherlands and then he went to Berlin. In 1802 he was elected to the United States Senate. Six years later President James Madison appointed him Minister to Russia. Adams was Secretary of State when James Monroe was President. He organized joint control of Oregon with England and helped get Florida from Spain. Adams helped make the Monroe Doctrine. Adams was elected president by the United States House of Representatives after the 1824 United States presidential election gave nobody a majority of electoral votes. People who wanted Andrew Jackson to win said there was a deal between Adams and Speaker of the House Henry Clay. Adams made Clay his Secretary of State. Adams passed law for U.S. improvements as part of what he called the "American System." This means he created roads, canals, and used high tariffs, or taxes on imports and exports. Among his proposals were the creation of a national university, a naval academy, and a national astronomical observatory . Adams fought Congress many times as many supporters of Andrew Jackson did not like his support of a national bank and tariffs. Adams lost the 1828 election to Jackson. The election was noted for the personal attacks made by the candidates against each other. Adams returned to Massachusetts for a short time after he was lost. He returned to Washington D.C. in 1831 after being elected to the United States House of Representatives. He was a leading opponent of slavery. 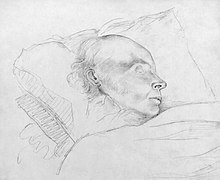 He remained in Congress until his death on February 23, 1848. This page was last changed on 22 March 2019, at 13:31.